Zarb is one of the beautiful and delicious treasures of Bedouin culture. 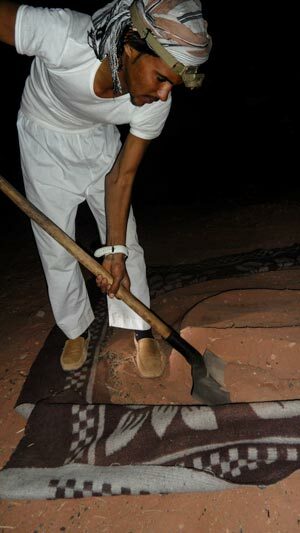 For centuries Bedouins in the whole Arabian Peninsula cooked their food underground in earth ovens. This way of cooking does not require much equipment. Which was important as Bedouin traveled a lot as they roamed the desert in search of water and pastures. Over time a few things changed. For example, nowadays we use metal ovens. And if we wrap the meat we use foil instead of palm leaves. In this blog we explain you in 7 steps how to prepare Zarb. Depending on your skills, it will take you between 4 and 5 hours to prepare your Zarb. Using chicken will save you an extra hour. If there is no pit available, the first step is to dig a big hole in the sandy ground. Put the metal oven casing in the hole. And carefully put the sand around the oven. Only the edge of the oven needs to stand out. Start by making a fire with small pieces of wood. If the fire is burning well enough put in the big pieces of wood. They will catch fire and the only thing you need to do, is to let it go. Once the fire is gone the wood will change into hot coals. Put the hot coals on the bottom of the casing. Traditionally we make Zarb with meat like chicken, goat or sheep. First you cut the meat in pieces that are roughly the same size. Then you wash the meat. Now it is ready to be marinated. Put water, lemon juice, garlic, salt and pepper in a bowl. Now add the meat and put it aside for about an hour to absorb the flavours. As we have no fridge in the desert, it is not possible to marinate the meat longer. Step 4 is an easy one. Prepare the vegetables. We use vegetables like potato, tomato, carrot, onion, cauliflower, eggplant and sweet pepper. First clean the vegetables with water. Then cut them into pieces. Leave the tomato’s in bigger pieces that the potatoes and carrots. As they need more time to get ready. The barbecue rack has 2 or 3 layers. Normally you put the vegetables in the top. And the meat in the bottom. This way all is prepared well. Sometime you will see the meat mixed with the vegetables. Most of the time the meat is then cut into small pieces. If you want to create the dark dry layer on the meat, put the meat in the top. And put some hot coals on the lid. Put the rack over the coals in the oven. Close the oven with the lid. Cover it with a blanket. And put sand on top of it. This way you keep all the heat inside. In case you prepare Zarb with sheep or goat meat, the cooking time will be about 2,5 hours. For chicken 1,5 hours will do. While waiting for the meat and vegetables to be cooked, you can prepare the side dishes. Cook the rice, create tasty salads with tomatoes, onions and cucumber, and prepare humus and mutabal. Once the food is ready, remove the sand and the blanket and open the lid. The delicious fragrances of the slow-roasted meat and vegetables fill the air rapidly. And turn you hungry instantly. Pull up the rack and place it next to the side dishes. Enjoy the tender and smoky meat and the perfectly cooked vegetables. Hi! I’m curious what Bedouins used to use for the rack, before modern times. Or did folks simply wrap the ingredients in separate palm leaves? Also: What’s the Bedouin Arabic word for the rack? Thanks for your question. In the old days they dug a hole in the sand and created a round wall in it to keep the sand from falling in again. Inside the hole they made a fire. When the wood turned into hot coals they put the meat in the top of the coals and covered the hole with a big round stone. To keep sand away they covered the stone with some branches. We use different words use to refer to the rack. 30 years back, I was invited to a desert dinner like this one near Riyadh. We dug a hole, made fire, let it smoulder into hot coals, wrap the lamb, veggies and rice in wet white cloth and burlap (Jute bag), more hot coals at the top and cover with sand and sprinkled water and after about 3, 4 hours, when we carefully dug the sack out, unbelievable…meat was cooked to perfection, falling off the bone, tasty. Thanks for sharing your story. It is great to hear how an experience like sharing a special meal can stay with you all your live!